Need more information about booking Home 10144 ? Casa Com Vista is set in the charming village of Santa Barbara de Nexe, situated about 10km inland from Faro, nestling in the foothills and enjoying panoramic views of the coastline. Overlooking a beautiful 10m long pool in completely private surroundings and having accommodation of Entrance hallway, cloakroom / 3rd WC, well equipped Kitchen, Lounge open into Dining area with side garden view. En suite shower room to master bedroom with super king bed, two further bedrooms with king size beds, all bedrooms having air conditioning, family bathroom. Full length balcony with superb panoramic views to coast . Each bedroom and lounge with French doors opening to balcony. Shaded area on the poolside and BBQ area for alfresco dining. 6 sunbeds and 3 parasols for when the shade is welcome. Extended lawned garden to side with shady areas and olive tree. Superb location for the family holiday where you want the privacy of your own pool and surrounds yet within 20 mins of beaches, golf and many quality restaurants. Ideal for families. Winter prices (from November to March) quoted are per couple. In winter the cost of electricity,water and logs will be charged to the guests. We have also hosted an intimate wedding with the ceremony held on the villa balcony. Photos available on request. Please take time to see what our many guests say about the villa in TripAdvisor reviews. More reviews than any other advertised Santa Barbara villa. If you wish to make a reservation for any date not yet released please enquire and we will be pleased to work out a tariff. We recommend you hire a car as this is the bast way to get around. Head for your chosen sights for the day but don't forget to stop and sample the delights of all the quaint villages, rustic towns and of course the breathtaking views. In 2017 the new Mar shopping complex including the Algarve’s only Ikea, along with a Designer Outlet opened. This is within 5 km and provides an ideal day for those suffering from shopping withdrawal symptoms. This Villa has 3 bedrooms, 3 bathrooms and sleeps 6. It’s been listed on Holiday Lettings since 16 Mar 2006. Located in Faro District, it has 65 reviews with an overall rating of 5. The average weekly rate varies from £325 to £1500. Casa Com Vista was the perfect get a way for a relaxing holiday with views to die for.It was well equipped with all necessities and a lovely private pool. Very near to Faro definitely need a hire car but quite close to lovely beaches.Will definitely visit again. This was probably the nicest villa I’ve stayed in so far. It felt so welcoming and like a home from home but in such a beautiful, peaceful setting with amazing views. We loved the surrounding areas and how accessible it was to tour the Eastern & Central Algarve from there. The villa had everything we could think of that we needed and everything had been so well organised. The furnishings were comfy & tasteful too. It was too cold for us to try the pool but it looked very inviting! The weather was quite windy & rainy during the week and we had several power cuts in the evenings but could see that the whole surrounding area right down to Faro was the same and luckily the power was always back on before long and torches are available to hand! It added to the adventure of our stay! For kids we recommend the science museum in Faro for rainy days it was really great & interactive & there is an indoor Lego play crèche in the nearby shop mall at Loulé! Our favourite beach is still Barril! We would love to return one day & would definitely recommend! We have been coming to this beautiful villa for the past 10 years and never get tired of it. Sometimes twice a year. Immaculately clean, fabulous panoramic views, and very private. Lovely local village where we have made friends with the locals. Angelo with his warm friendly restaurant, and his lovely wife and son Francesca and Fabio. Also Julie at Julie's bar who does a mean full English breakfast. We will return again next year. All thanks to David and Mary the owners. Stayed at Casa Com Vista for 2 weeks in July 16. It is a wonderful Villa and a perfect location, a nice walk from Santa Barbara de Nexe. The view is spectacular from the balcony. I would rate it highly and recommend it thoroughly. Dave and Mary were very easy to work with and there were no difficulties in booking. Looking forward to returning. Hospitality right from fist contact , arrival an departure. Route description clear, also because we know the area.Great privacy. When in summer great place with the well secluded swimming pool. Suitable for families and/or up to 3 couples Will be back when the opportunity arises to travel again to to Algarve. Highly recommended..
my 7th visit to Casa Com Vista and I wasn't disappointed. It's like visiting an old friend, As always the villa was immaculate, in particular the beds are clean crisp and very comfortable. A good nights sleep is always guaranteed. Every time I visit something is new or has been improved even further. Fabulous pool and gardens and the views are amazing! Love, love, love it!!! The local village has lots of amenities, coffee shops, bars, excellent Italian restaurant, well stocked supermarket etc. Ideally you will need to hire a car to make the most of the surrounding areas. but just chilling out at the villa is a fabulous place to be. 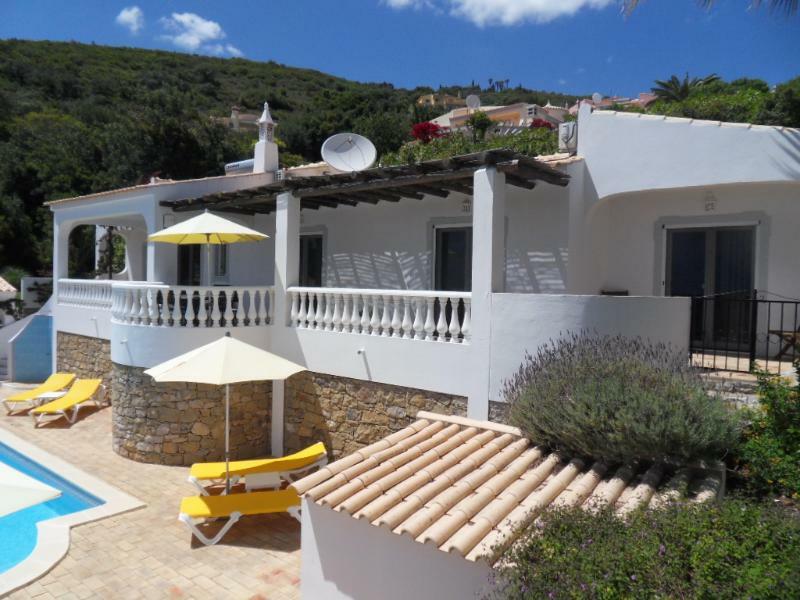 This is a great villa with fantastic facilities and stunning views. The location is great, near to a lovely village, which has everything you need i.e. restaurants, bars, shops and a supermarket. It's only a 15/20 minute car journey from Faro airport. Faro town itself offers even more facilities ans it's only a 15/20 minute drive to the coast, if you fancy a trip to the beach. The villa is beautifully maintained as are the gardens and pool. The owners are very friendly, helpful and great to deal with. Overall a brilliant experience, we highly recommend Casa Com Vista and will definitely return. Another wonderful holiday in this fabulous villa. We visit every year and it feels like our "second home"! David and Mary the owners work tirelessly to ensure annual improvements and it never fails to impress! We love every minute of our stay and have usually booked the following year before departing for our current year's holiday! The villa is looked after by the wonderful Maria and is spotless! We never tire of the view and the location is perfect - and we now can't wait for next year. We have stayed at the villa many times as we find it perfect for our needs. Well appointed, great pool, spotlessly clean. The villa has everything you could possibly need from a self catering view point in a spacious kitchen. Towels and bed linen provided are of good quality. There is a large selection of books, DVDs, board games and a TV with free view and DVD. You will need a car as the villa is right up in the hills. All in all a fantastic villa, supported by a fantastic infrastructure of cleaners, gardeners, pool cleaners and of course owners who make booking very easy and flexible. Beautiful, beautiful villa, so light and extremely clean, fabulous facilities. Everything you could want for a stay in the sun. The beds are extremely comfortable and the linen so pristine you are guaranteed a fabulous nights sleep. . Maria, the maid, does a fabulous job of ensuring the villa is perfect. The pool area is fantastic and the views from the villa are beautiful especially at night with the twinkly lights. The village is a 20 minute walk away and has good amenities. Local bread and coffee shop. Supermarket for your needs including fabulous wines from e1.49. Angelo's is the local Italian in the village, I would say one of the best, fabulous food with a very varied menu and specials board.. If you go on the live music night's you are guaranteed a fabulous night. Had a fantastic time and will not hesitate to return. You can get in touch with Mary blount/ (the owner) through the contact form on this page. Send Mary blount/ (the owner) an email through the contact form on this page. Alternatively, if there’s a phone number on this page, you can call them. How do I contact Mary blount/ (the owner)? You'll need to send Mary blount/ (the owner) an enquiry to book - the owner will let you know how to pay. If they accept online booking they'll send you a quote and info on how to pay. If you pay through our website you’ll be covered by Payment Protection. Or you can send Mary blount/ (the owner) an enquiry through the contact form to request a quote. Mary blount/ (the owner) will email you the total cost for your dates and how to pay. Send Mary blount/ (the owner) an enquiry through the contact form requesting a quote for your holiday dates. Mary blount/ (the owner) will email you the total cost for your dates and how to pay. Mary blount/ (the owner) of this property is responsible for taking and refunding your damage deposit. The damage deposit terms should be agreed before booking and outlined in the booking contract, if Mary blount/ (the owner) supplies one. Please refer to these details or contact Mary blount/ (the owner) directly if you have any questions. You'll need to contact Mary blount/ (the owner) to cancel. They should have provided their contact details when you made your booking - otherwise, email them through the contact form. You'll need to contact Mary blount/ (the owner) to edit your booking. They should have provided their contact details when you made your booking - otherwise, email them through the contact form.